1. Prepare the broccoli by separating it into florets. Fill a large saucepan with plenty of water and bring to the boil. It should be big enough to easily accommodate the broccoli. Once boiling, add salt and throw in the broccoli for two minutes. 2. Using a slotted spoon, quickly transfer to a bowl full of ice-cold water (this stops the cooking and keeps the emerald green brightness of the vegetables). Drain in a colander and allow to dry. 3. In a mixing bowl, toss the broccoli with 45ml of the rapeseed oil and a generous amount of salt and pepper. 4. Place a ridged griddle pan over a high heat – until it is extremely hot. Depending on the size of your pan, you will probably need to griddle your broccoli in several batches. Don’t cramp the florets and turn them as they grill so they get char marks all over. 5. 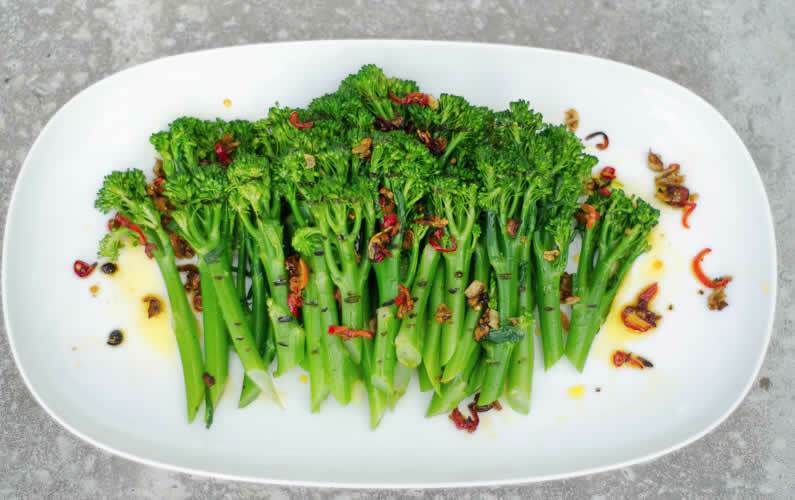 While grilling the broccoli, place the rest of the oil in a saucepan with the garlic and chillies. Cook over a medium heat until the garlic begins to turn golden brown. Be careful not to let them burn. Pour the garlic, chilli and oil over the hot broccoli and toss together well. 6. Just before serving, spritz with some lemon juice or flaked almonds. If you don’t have a griddle pan, don’t worry you can fry the florets over a high heat in a heavy pan instead, but be warned after tasting this dish you will probably be running out to get a griddle pan so you can enjoy it over and over again.